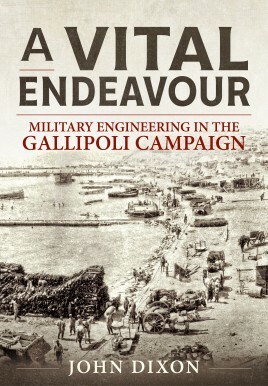 This book addresses the work of the Royal Engineers during the Gallipoli Campaign. It seeks to demonstrate the involvement and commitment of the Corps of Royal Engineers for almost nine months of the campaign. Whilst the Gallipoli Campaign has received considerable interest over the years, the work of the Royal Engineers during that campaign has been largely overlooked. This book seeks to address this oversight to demonstrate the amount of engineering work required for a seaborne invasion. It was the engineers that provided the technical and professional back up for the rest of the Mediterranean Expeditionary Force and produced the knowhow to keep the men in the front line supplied with all manner of necessities for their work. The Royal Engineers were working on the first day of the landings and were amongst the last to leave on the evacuation, and their story includes all the major engagement of the campaign. It also includes the sometimes difficult tasks of providing infrastructure to the peninsula handling all kinds of engineering works, from piers to land the stores, to roads and railways to distribute the equipment to the various parts of the line. A large part of their work on Gallipoli was the location and development of water supply across this dry peninsula. They dug wells, constructed reservoirs and provided miles of piping to connect both with watering points across the dry landscape. They were also responsible for all the land based signalling, with a number of signal companies established to ensure that messages were relayed with as little delay as possible. It was not long after the first exchanges that it was clear that some of the siege techniques of the Western Front would need to be employed and the Royal Engineers provided the expertise for the mining work that took the underground war to the Turkish army. It was not long thereafter that the Allied miners had a more or less complete mastery of the underground war. The demands of the front line fighting man meant that the Royal Engineers needed to rapidly become masters of their environment as they carried on their construction work throughout the campaign, and were ultimately to carry a large responsibility for providing the means to evacuate the soldiers and stores when an end to the campaign was called. The book looks at the structure of the Royal Engineers at the beginning of the Great War and the way in which in which they sat within the structure of the MEF and how their work was controlled at Brigade, Division and Corps level. This book is organised to show the work of the Royal Engineers, and the units of the Australian and New Zealand armies, at each stage of the campaign, putting their work in the context of the major offensives of the campaign. It also addresses briefly the work of the engineers on the nearby islands, such as Imbros, where GHQ was based, and Lemnos where engineers worked on everything from harbours to hospitals. John Dixon is an author and historian. "Men who are Determined to be Free"